If I delete a file accidently on my OneDrive can I get it back? Yes all files that are deleted a move to the recycle bin, they remain here for 14 days after which time they are automatically deleted. To retrieve a file from the recycle bin click on settings then site settings as shown below. This take you to the recycle bin where you should see your delete file, then follow the steps below. Where can I get more help on OneDrive? What is the share with everyone folder in OneDrive? Share with everyone as the name suggests allows you to share files with others. To share a file place it in the share with everyone folder and then click on the file menu as shown below, then click on share. Here you can enter the email address of the person you want to share the file with. Note care should be take when sharing or allowing others to access your files. Do I need Microsoft office installed on my PC to create a new Microsoft document? No with OneDrive you can create a Microsoft word, excel or PowerPoint document with having Microsoft office installed on your PC or device. There are however some limitation to the OneDrive version of office, it does not contain all the features that full Microsoft office has. 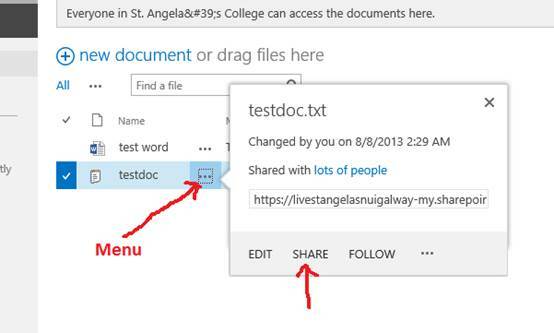 To access your OneDrive log on to your college email by clicking on the email icon at the student portal page www.stangelas.nuigalway.ie/students when inside your email click on the SkyDrive link at the top of the page as shown below. What can I use my OneDrive for? Your SkyDrive can be used for file storage. You can also use your sky drive to create new Microsoft word, PowerPoint or excel documents. OneDrive is an online (or cloud) storage system. Each student receives 25 GB (shared with email) of personal storage. OneDrive is accessible from any device that has internet access.